The glory, glory days of the Suzuka 1000kms are long gone, the days of the international teams going head to head with their weapons of choice designed for international racing finished with the end of the 20th century. 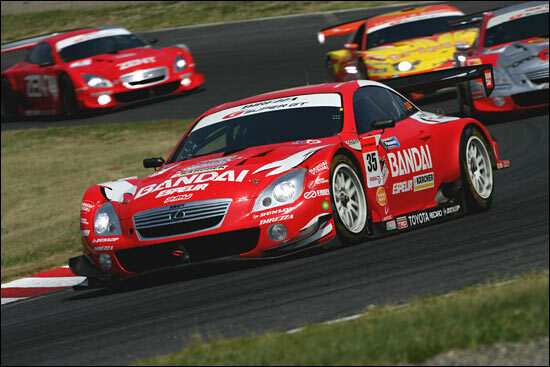 But the race still lives on - as the blue riband event of the Super GT Championship, and as such it still attracts the factory teams, albeit with racing weapons designed purely for the domestic racing scene. 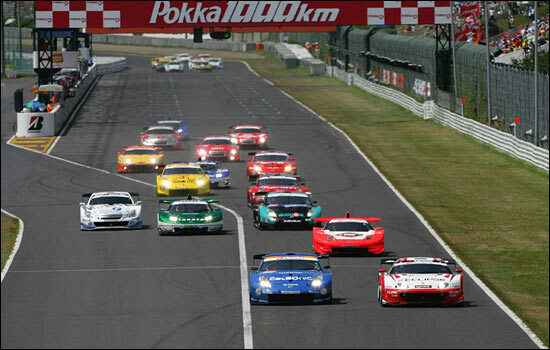 The 35th International Pokka 1000km race was round 6 of the 2006 championship and would be a head to head duel in front of 35,000 spectators between the Nissan, Lexus (Toyota) and Honda equipped GT500 squads, with the usual weird and wonderful array of GT300 machinery contesting the ‘junior’ class. 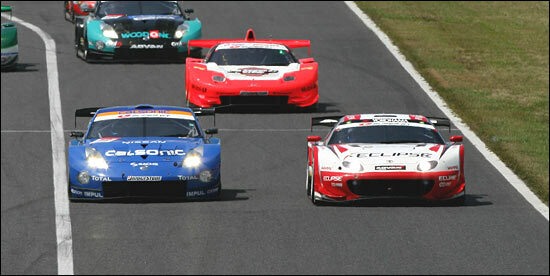 The 173 lap race saw a lights to flag victory for the polesetting #12 Calsonic Impul Nissan Fairlady Z team, its dominance of the meeting belying the fact that this was the first win of the 2006 season for the #12 team. It was one of the team’s two French stars, Benoit Treluyer who earned the team the right to lead the race off from the start, and from the very beginning he extended his advantage. Team mates Jeremie Dufour and Kazuki Hoshino, (son of the legendary Kazuyoshi Hoshino who manages the team), both maintained Treluyer’s hard fought lead and by the completion of the race the #12 car had lapped all but the second placed #22 Fairlady Z, piloted by the all-European driver squad of Michael Krumm, Richard Lyons and Fabio Carbone (the latter didn’t actually drive). The final step on the podium was taken by the first of the Lexus SC430s home, Peter Dumbreck anchoring the crew of the #35 Bandai car alongside Naoki Hattori and Eiichi Tajima, the Lexus finishing just ahead of the best of the Honda NSX runners, the Loic Duval, Hideki Mutoh #32 Epson sponsored car. The GT300 class too saw a runaway victory for the pole position car, the #52 Proµ Taiyo Oil Toyota Celica again scoring a debut race win and, significantly the first Super GT win for Kumho Tyres in only their second season of super GT competition. Benoit Treluyer: "The car was perfect. It was almost as if all we drivers had to do was go along for the ride. The pit work was perfect too. It was just a great weekend. I want to thank the team, Nissan and the fans. I am really happy!" Kazuki Hoshino: "Thank you, everyone! I am just so happy. But, to tell you the truth, I am the one who should have been driving at the end. It is just that the manager [his father] doesn't trust me completely yet." Jeremie Dufour: "I feel fantastic. Actually, this is my first race of the season [being a spot entry], so it was great to win. The car was so fast we didn't have to push it at all. I am thankful that Benoit went out an got us a lead from the start. I am also grateful to everyone on the team." Hironori Takeuchi - #52 Celica: "Yesterday was the first time we won the pole position [this season], so I still can't believe that we won today. We have been working with KUMHO Tire since last year and I have to admit that we had a lot of problems with communication and such at first. But after a year and a half of working together, we have really come to understand each other and the performance of the tires has improved a lot. It took a year and a half, but with this win I think we have finally been able to pay back KUMHO Tire for their efforts and our fans for their support."